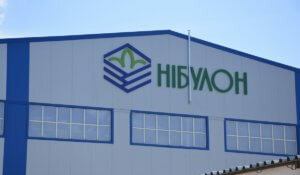 Nibulon (Mykolaiv), one of the largest grain traders in Ukraine, is launching a new comprehensive project involving the construction of a port complex in Ochakiv (Mykolaiv region), which will become the base for the company’s fleet. 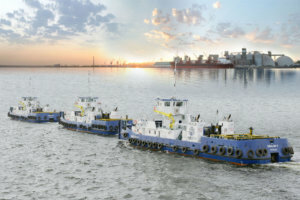 “Our company is starting to work on the implementation of a new complex project at the mouth of the Dnipro-Buzky estuary. The base for this project will be Ochakiv fish canning plant, whose property we purchased at an auction. That is why our investment program at the mouth of the Dnipro-Buzky estuary will include two parallel directions,” Nibulon CEO Oleksiy Vadatursky said on his Facebook page. According to him, the matter concerns the construction of a port complex and the restoration of fishing industry, in particular, the processing and canning of fish, crustaceans and mollusks in the Dnipro-Buzky estuary. “This is a complex project, therefore we are also considering the possibility of building a specialized fleet for the needs of this industry at our own shipbuilding plant,” Vadatursky said. Nibulon was established in 1991. It is one of the largest operators in the grain market of the country. Nibulon will invest $19 million in construction of a river transshipment terminal in Ternivka (Zaporizhia region). According to a posting on the company’s website, the launch of the terminal is scheduled for June 2019. Along with the terminal, the project envisages construction of a berth of over 3 km long and dredging works on the Ploska Osokorivka River. The company said that the terminal will hire 120 employees and will pay over UAH 2.7 million of taxes to the local budget a year. 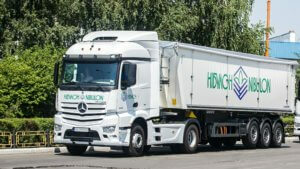 The terminal will be third for the company in Zaporizhia region. Nibulon was established in 1991. It is one of the largest operators in the grain market of the country. Nibulon cultivates 83,000 hectares. It exports agricultural products to more than 60 countries of the world. The annual export volume exceeds 4.5 million tonnes. ING Bank N.V. (ING), as a mandated lead arranger and bookrunner, a syndicate of European commercial banks, and the European Bank for Reconstruction and Development (EBRD) have signed an agreement on providing a $80 million syndicated term loan for Mykolaiv-based Nibulon. The assets will be used to finance the company’s working capital needs associated with purchase of commodities in Ukraine and exports to the global market, according to a reports on the company’s website. The loan tenor is three years. Nibulon was established in 1991. It is one of the largest operators in the grain market of the country. It has elevators with a total capacity of about 2 million tonnes, as well as its own transshipment terminal with a capacity of 5 million tonnes in Mykolaiv. The company has 11 river terminals on the Dnipro and the Southern Buh, its fleet consists of 67 vessels. Nibulon cultivates 83,000 hectares of farmland. It exports farm produce more than 60 countries. The annual volume of exports exceeds 4.5 million tonnes. Nibulon on May 23, 2018 commissioned a new elevator complex for transshipment of grains and oilseeds with a capacity of about 43,000 tonnes within the loading terminal in Mykolaiv. According to a report on the website of Nibulon, the complex includes six tanks with a capacity of 7,200 tonnes each. In addition, the pier with a length of 222 meters has been reconstructed. “The new complex with equipment from the manufacturers Bühler GmbH (Germany), Precia SA (France), Cimbria Unigrain A/S (Denmark), UAB Liucija (Lithuania), etc. 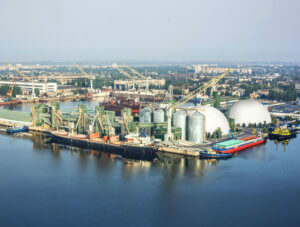 increased the total capacity of the grain storage facilities located in the territory of the company’s transshipment terminal in Mykolaiv to 173,000 tonnes and allows separately and simultaneously storing seven different crops,” the report states. Nibulon was established in 1991. 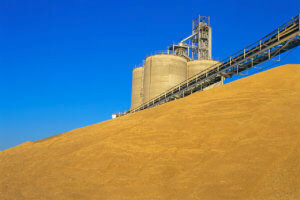 It is one of the largest operators in the grain market of the country. It has elevators with a total capacity of about 2 million tonnes, as well as its own transshipment terminal with a capacity of 5 million tonnes in Mykolaiv. Nibulon cultivates 83,000 hectares of farmland. It exports agricultural products to more than 60 countries. The annual volume of exports exceeds 4.5 million tonnes. Nibulon plans to start building cargo sea vessels in summer 2018, Director General of Nibulon Olekskiy Vadatursky has said in an interview with the Ports of Ukraine publication. “In March this year, for the first time at our shipyard, building of a dry cargo ship with a length of 100 meters was launched. And in the summer, after the reconstruction of the shipyard facilities, we will be able to build full-sized cargo ships of 140 meter length. We plan to build a specialized marine vessel with deadweight of 10,000 tonnes as a transshipment raid station,” he said. According to Vadatursky, the vessel will be equipped with two cranes, which can handle up to 20,000 tonnes of grain per day. The deadline for its delivery is July 1, 2019. “As we build our own marine fleet, we will extend the transport chain from the agricultural producer to the final consumer on the Nile,” he said. The general director of Nibulon said that for the 12 years since the beginning of the implementation of infrastructure projects, to date, $1.76 billion has been invested, in particular about $100 million over the past year.